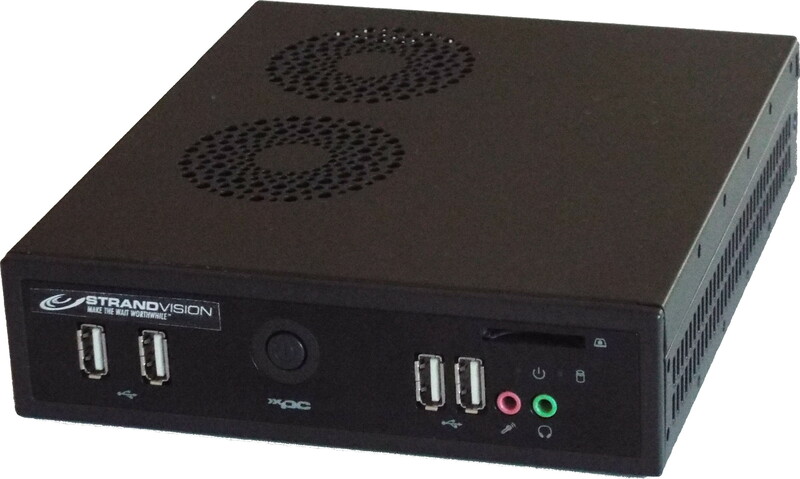 StrandVision LLC and Shuttle Computer Group, Inc. announced a marketing agreement under which StrandVision will sell a new digital signage point-of-display digital media player. The device is based on Shuttle DS61 hardware that comes preloaded with, and is optimized to display, StrandVision’s patented digital signage content software. Branded the StrandVision R360 Digital Media Player, the new player is a slim (6.5″ x 7.5″ x 1.75”), powerful x86-based Linux digital signage platform that offers the best quality, performance and connectivity to process high-quality digital media. When coupled with StrandVision’s Internet–based, hassle-free, digital signage software, it presents an unparalleled electronic signage package. To learn more about digital signage and how you can use a digital signage player at your facility, visit www.StrandVision.com or call us at 715-235-7446 (SIGN). In the digital signage industry, we are masters at creating jaw-dropping visuals. Video walls, custom-shaped screens and video columns show how we continue to push the bounds of what is possible with modern digital signage. But something I find particularly interesting is how digital signage is evolving “beyond the screen” to create a more sensory experience that is as entertaining as it is effective. This entry was posted in Uncategorized and tagged digital signage, digital signage player, digital signage solutions. Bookmark the permalink.